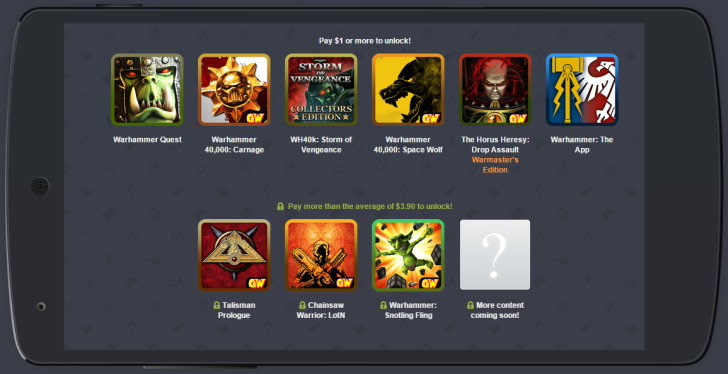 It's time for yet another Humble Mobile Bundle, so get your wallet out. No, really. Get your wallet out. You're going to want to buy this one. The Humble Games Workshop Mobile Bundle has nine games in the initial batch with more coming next week. If you like Warhammer, this is your lucky day. There are a ton of Warhammer titles in this one. This bundle has two tiers. There's the basic one that is unlocked by paying more than a dollar, then there's the premium one that is only unlocked if you pay above the average price ($3.90 at this moment). The basic tier has most of the Warhammer stuff, including the recently released Space Wolf strategy game. It's pretty rad. More games will be added halfway through the bundle, but you need to unlock the premium tier to get them. The bundle will be available for two weeks.